Spend a week in the cosy Hotel Les Templiers and head out each day to discover a new face of the Pyrenean winter experience. Four days snowshoeing with a guide (outings designed to suit your level), and then two days optional activities of your choice: perhaps an excursion to Argeles market, a cable car ride up the Pic du Midi Observatory (can tie in with a day skiing at Grand Tourmalet), paragliding, cross country skiing, walking independently on trails around Luz St Sauveur or Arras en Lavedan. 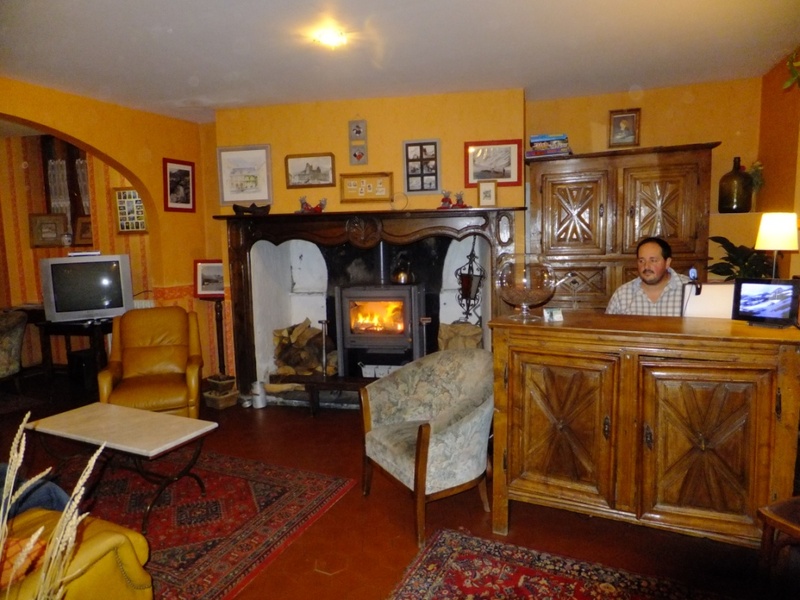 We are here to ensure you maximise your enjoyment here in the Pyrenees! The holiday runs from two or more participants. Where: B&B accommodation in Luz St Sauveur at the cosy Hotel les Templiers (confirmed from two people). 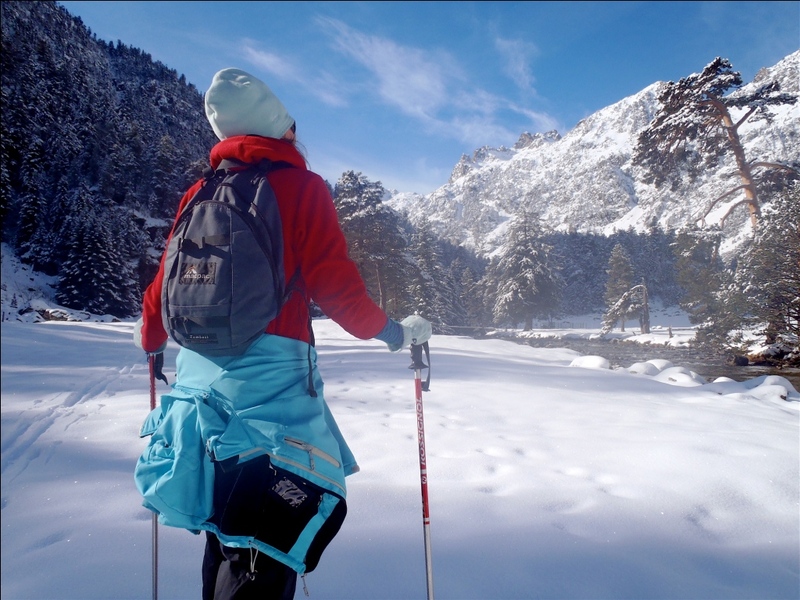 What: Four snowshoeing outings with a qualified guide, two free days - you could ski over to the Pic Du Midi Observatory, have a morning at the Argeles market, try dog sledding, enjoy a lower altitude independent walk. When: Every week from 5 Jan - 13 April 2019, holiday runs with two or more people. Sat-Sat dates - contact us if you'd like to start another day. Price Templiers B&B (twin share): 975€pp, includes seven nights accommodation, four days guided snowshoeing, all the help you need to organise activities on the two extra days. Trip runs with two or more people. Come back each day to the hotel for a hot chocolate by the fireside and a three-course meal, or your cosy cottage to concoct your dinner, the perfect end to an active day in the snow. If you wish you can add on some treatments at the thermal baths - see the two night package for example, but others are available. Your guide will choose the best outings each day given snow and weather conditions. 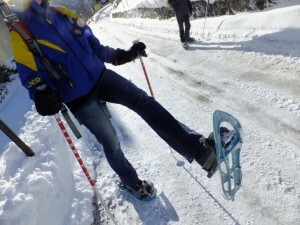 See What is snowshoeing for more information on what snowshoeing is all about. Day One: Arrival day. Collection from Lourdes train station or airport. Day Two: Snowshoeing day in the Barèges valley or the Saugué Plateau. Visit shepherd's cabin. 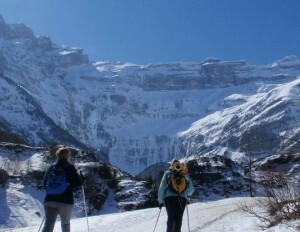 Day Three: Snowshoe from Gavarnie. You will quickly understand why the famous Gavarnie Cirque received its UNESCO world heritage listing as we climb above it for a birds eye view. We may see climbers on the frozen waterfalls of the cirque and walk behind other frozen waterfalls to catch the light shining through the green/blue ice. Day Four: Today is market day in Argeles. At the junction of several valleys this authentic local market that has run continuously, every Tuesday, since the 13th century (or so they say!). Stock up on delicious cheeses, patisserie, duck confit, foie gras and other local delicacies from nearby producers. Or choose to ski for the day. Or sleep in and spend the afternoon at the thermal baths. The choice is yours. Day Five: We snowshoe in either the Fruitière or Aygues Cluses valley today, depending on condition. We build a fire and cook up a spread of local products including duck breast and sides on our open fire...maybe even with a little glass of wine followed by hot coffee and blueberry tourte for desert. We then wind back down the snowy valley following the semi-frozen river with its beautiful ice and snow formations. Day Six: Another day out snowshoeing, perhaps to the Marcadau Valley, or back around Barèges. There are plenty of possibilities and we can choose according to whether you'd like to do a small summit, head up to a lake or high pass. Day Seven: Your last day is a free day.. take a walk on the paths around Luz or Arras, go skiing, dog-sledding, paragliding. We'll organise the activity of your choice. Disclaimer: This is an example of itinerary that we attempt to follow depending on weather and snow conditions. The order of days may be changed to suit weather forecasts and, in all cases safety in the mountains is our main consideration. ¤ All equipment, aside from clothing, needed for snow-shoeing including avalanche detectors (see safety in the mountains). ¤ Four days guided walking, transport to and from walks. ¤ Seven days accommodation + breakfast in Hotel Les Templiers, seven dinners in the Templiers or a neighbouring restaurant, or seven nights self catering accommodation in Blue Cairn Lodge. ¤ Possibility to change from half board to 'a la carte' dinner for part of the week. ¤ Transport from Lourdes to Luz and back and all transport to walks. ¤ Activities on the two free days. There are plenty of things to do - we can give you independent walk notes and maps for lower altitudes walks, help with a trip to the market, organise for a day skiing or an excursion to Pic du Midi. ¤ Picnics - there is a fridge in the lounge of Hotel Les Templiers and a small supermarket, bakery and charcuterie all close handy. ¤ Drinks each evening, wine and coffee with dinner. To book you can use the on-line booking system below - select your Saturday check-in date and Saturday check-out date and then proceed. The system will ask for a deposit which you can pay using PayPal. Or, if you prefer, you can book by emailing us directly (sian@pyrenees-mountains.com), ringing directly on +33 5 62 92 81 52 or calling via Skype at sian.grigg.